At Inspirations Wholesale, we revel at the opportunity to think of the very best ways for you to add a magic touch of Easter to your home, and that is why we like to put lots of thought into how your can give your home a new burst of stylish energy and excitement for this year’s Easter celebrations. Throughout the Easter period, whether you are enjoying a family breakfast time with your kids home for the Easter break, taking the opportunity to host some fun Sunday Lunch get togethers with your friends, or organising an Easter event on a larger scale, one way of adding a touch of design flair is by carefully considering the stunning Easter table setting ideas that you can create to bring a smile to your guests’ faces. Moving past the winter period, where Christmas decorations often centre on a dark green and dark red theme, when Easter time comes around, it is nice to capture the mood of rejuvenation, replenishment and energy with a brighter palette. Light greens, light blues, yellows and pinks are all great for this purpose, especially when you are getting your table set for breakfast, brunch or lunch, when the brightness of the fresh day and the colour theme of the table can be in perfect synchronicity. And, even if it is cloudy and rainy, the bright or pastel colours on the table can help lift the mood in that case! Easter is of course the time of the bunny, and this means that there is an opportunity to bring into the mix some ornamental items that are at once highly cute and elegantly stylish. By adding a bunny motif to your dinner table, you will be able to create a subtle and yet distinct Easter ambience which will set the scene perfectly for your meal. Natural, clean colours and textures such as white or wooden finishes especially will do the trick for a contemporary Easter bunny theme. While adding colourful bunny accessories to the table setting will fit in with the bright, refreshing mood of the season. Try a bunny cake stand for a decorative and yet practical item for your Easter table or choose tiny little flocked rabbit figures that sit on each napkin for a seriously cute detail. You could even include carrot motifs to accompany your bunnies on the table. These small touches can go a long way in creating a gorgeously joyous mood. As well as ornaments that can be placed on the table’s surface, opting for some hanging decorations can be a wonderful way of bringing an extra dimension to your Easter table setting décor. To enable this though, you will of course need to think about what you are going to hang your decorations on. One fresh and fun idea might be to use white or natural branches, which will create the perfect structure from which to hang some super cute hanging egg decorations. 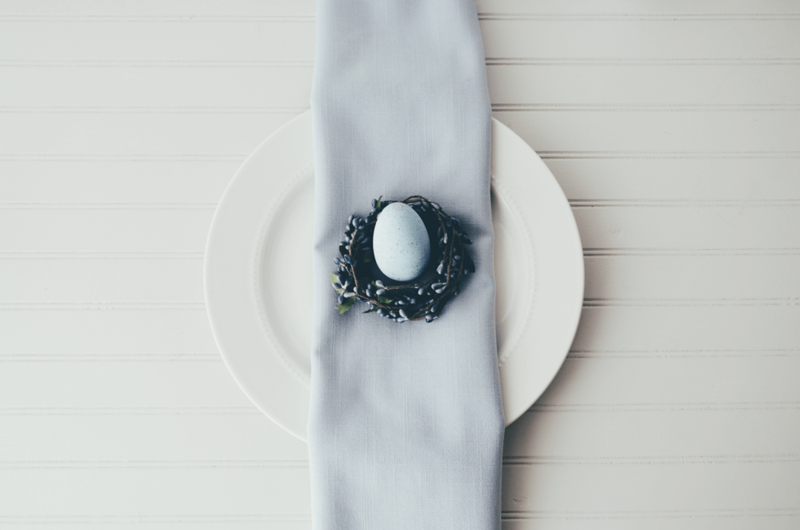 A simply delightful idea, this will once more be a great way to add bit of colour and a bit of Easter charm to your table, with the branches bringing an element of sophistication and the eggs adding plenty of fun into proceedings. Create them as a centrepiece in a vase or perhaps (if your table is large enough) lay slender branches across the middle of the table and hang the decorations from the higher points. Alternatively, the branches can be used to accessorise the dining space, in corners of the room or perhaps hanging overhead like a canopy. There is rarely a more delightful decorative addition to the home than a wreath, and it is certainly not something that is just for Christmas! In the Easter period, you can explore lots of fun and beautiful options such as wreaths which have egg-themed designs. These can of course be placed on your door, but then they can also be put into use on the table, perhaps being positioned around a vase of flowers or two, or used in a way that mimics the appearance of a nest with eggs piled in the middle. This would be a fantastic centrepiece for the table over the Easter period, whether it is for breakfast, lunch or dinner. Alongside your carefully chosen Easter ornaments and decorations, flowers will also tend to play a large part in the spring decorations. Symbols of life and fresh growth after a dark dormant winter, flowers are the prefect addition to a feature centrepiece or for individual places at the tables. However, the real thing can be unreliable, prone to damage, irritate those with allergies and may not last very long. Our artificial flowers, foliage and trees are so incredibly realistic and high quality that you’ll find it difficult to tell the difference. Explore our selection to find just the right types of faux flowers for your Easter occasion. From large bespoke commercial blossom trees to delicate looking wild daisies, whether you are organising a large Easter event or simply adding Easter decorations to your own home, we have some excellent options for your table or dining space. Explore more of our artificial flowers range and our full Easter range online to help you create the perfect Easter table setting.